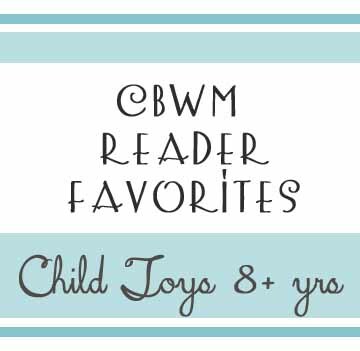 In this post, please share your child’s favorite toys for ages 8 and older. Please share the name of the toy and a brief reason why you/your child likes it. Please also include the age your child liked it since there is a large range here. You can also add a link to be sure I will be able to identify the correct toy when I move it to the main body of this post. Thanks so much! i do not have an 8 year old but I think Legos is a huge thing I loved and my brother at this age (and my 6.5 yr old is really getting into it). So I will look into Lego sets and adding on to what we have as we don’t have many official “legos”, it’s been mainly the Duplos up til age 5 so far here (and in part because of my 1 yr old I have not pushed the Legos too early as the small parts are hazardous). I think for a girl it will be Barbies (my 6.5 yr old is getting into them and I loved them as a girl). So i’ll be doing the whole Barbie and accessories. Lastly for a physical toy/exercise I am thinking rollerskating might be in that age?? I know some of the 6 yr olds are trying to do traditional rollerskating so maybe by 8 rollerblading?